ICCS 2017 in Zürich, Switzerland, will be the seventeenth in this series of highly successful conferences. Located in central Europe close to the Alps, Zürich is Switzerland’s largest city and one of the world’s main financial hubs. In addition to the Swiss Federal Institute of Technology, one of the world’s most distinguished research institutions and the proud host of ICCS 2017, Zürich is home to many parks, museums and churches. The city stretches out on both sides of the Limmat river, which flows out of the beautiful Lake Zürich. (see the location page for more information on Zürich and Switzerland). Since its inception in 2001, ICCS has attracted increasingly higher quality and numbers of attendees and papers. Average attendance each year is about 350 participants. The proceedings series have become a major intellectual resource for computational science researchers and serve to both define and advance the state of the art of the field. An archive of the previous meetings is available through the Previous ICCS conferences page. Out of the submitted full papers to the main track and workshops, we will select some 30% high-quality papers for presentation at the conference and publication in the proceedings. These are published by Elsevier in the open-access Procedia Computer Science series and indexed by Scopus, ScienceDirect, and Thomson Reuters Conference Proceedings Citation (former ISI Proceedings) – an integrated index within Web of Science. The papers will contain linked references, XML versions and citable DOI numbers. 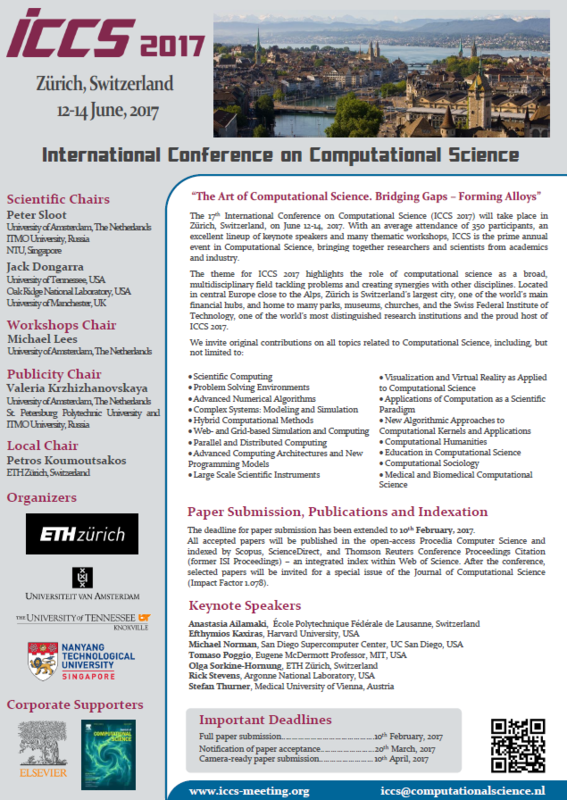 The theme for ICCS 2017 is “The Art of Computational Science. Bridging Gaps – Forming Alloys”, to highlight the role of computational science as a broad, multidisciplinary science tackling problems and creating synergies with other fields. This conference will be a unique event focusing on recent developments in: scalable scientific algorithms; advanced software tools; computational grids; advanced numerical methods; and novel application areas. These innovative novel models, algorithms and tools drive new science through efficient application in areas such as physical systems, computational and systems biology, environmental systems, finance, and others. ICCS is an A-rank conference in CORE classification. We look forward to welcoming you to this exciting event in Switzerland!